1. Core and empty contents of one passionfruit into mixing glass and save one half of the passionfruit husk/shell. Proceed to add remaining ingredients. Shake all ingredients with ice and double strain into a crystal coupe. 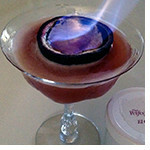 Fill used passionfruit husk/shell halfway with 151 proof rum, float the passionfruit husk/shell on the cocktail, and then ignite the 151 rum to create flame.